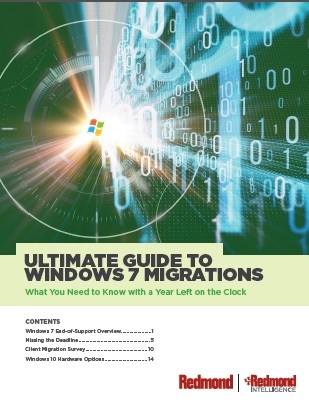 Download free white papers, e-books, technical reports, infographics, and other useful resources from Redmond Magazine's experts and our vendors. Also see our Free Webcasts. Redmond In-Depth Report: IT Security Battle: Is Microsoft All You Need? Many organizations are turning to DevOps to help them succeed in today’s intensely competitive markets by embracing Database DevOps practices. Learn more. For dedicated Brio users (Hyperion Interactive Reporting), working without a net has become the new normal since Oracle terminated premium support in April 2015. But when your business is on the line, any fall can be quite risky. Learn more. Life is all about choices. You can choose to muddle through manual tasks, or you can get the e-book on automating agile database development. One choice will slowly drive you nuts, and the other will make you the MVP of your team. Save your sanity. Get this e-book. In today’s IT environments, which are far more diverse and complex, traditional methods for imaging are simply unworkable. Learn more. Does your endpoint management extend all the way to management of your mobile devices, like smartphones and tablets? This paper explores the best ways to enroll, inventory, configure and secure mobile devices as you do your traditional devices. Learn more. Endpoint management has become increasingly complex. Besides deploying and maintaining a range of devices, operating systems and applications, you need to continually protect your network from increasing cyberthreats. Learn more. Read this paper based on a Fireside Chat between email archive migration veterans Nick Cavalancia of Techvangelism and Chris Clark, CEO of Trusted Data Solutions, to learn the best ways to approach the process. Learn more. What was once best practice is now an anti-pattern. In this whitepaper, we will review the new Digital Identity Guidelines from NIST and formulate a strategy that aligns best practice with compliance needs. Learn more. Is your Active Directory hygiene keeping you up at night? Address the low-hanging security vulnerabilities in your organization with our Active Directory best practice guidance, which includes physical security, access control, and authentication. Learn more. Why should you consider additional security protection around Microsoft Office 365 email use? And, what should you look for in a third-party solution? Read this paper and find out more! Ransomware is still one of the most lucrative weapons in a cybercriminal’s arsenal. This kind of cybercrime encrypts the files on a computer, and blocks access to them until the required ransom is received, generally in the form of bitcoin, an untraceable virtual cryptocurrency. Learn more. The frequency, sophistication and targeted nature of cyber-attacks has drastically changed the threat landscape. While most organizations have the means to detect known threats, although few of these types of attacks still occur, many still need to evolve their security practices to include detection of unknown attacks. Learn more. Cyber extortion is a form of blackmail in which victims of an IT attack are forced to pay to avoid its effects. The most common type of cyber extortion is ransomware, which is so popular among cybercriminals that it’s become a billion-dollar industry. Learn more. From booking a room to the payments made at shops and restaurants, hotel chains have complex networks that save enormous amounts of sensitive and private data, just waiting to be compromised. This makes the hospitality industry one of the main targets for cybercriminal activity. Learn more. Are You Ready For Your Fully-Funded Azure® Total Economic Assessment with Fujitsu? Whether you're an IT pro or CFP, you've heard Azure is the powerhouse cloud platform, preferred by 90% of Fortune 500 companies. It's within your reach with this unique opportunity from Microsoft and Fujitsu to receive your fully-funded, 6-week assessment of your cloud readiness. Read more! A Get Fit eBook: Peak Performance: How Your I.T. Network Can Get There. Read this eBook, to review common areas of strength—and opportunity—so you can develop a plan to take your organization’s IT to the next level by answering five key questions. Every company is, or will soon be, operating like a digital company, re-engineering operations to support the new speed of business. If you’ve invested in Office 365, you have the capability to execute a digital transformation. However, enabling and sustaining that capability can be challenging. Learn more. Read this paper to learn about an AWS cloud-based tool that can provide IT with a way to automate migrations, upgrades and data backup without any disruption for the end user. Learn more. Why do people take a risk and steal from their employers? How exactly does data theft play out based on different motivations? Discover top three threats that insiders pose to your data to protect it. Learn more. Office 365 licenses are incredibly diverse in both function and price. With a smart license strategy and a few tips, your organization can optimize license usage and minimize costs while simplifying day-to-day license administration. Learn more.